38 Chest / 32R Trs 1 Left! GIBSON LONDON 'MARRIOTT' MENS RETRO SIXTIES POW CHECK MOD VELVET COLLAR SUIT (Taupe). This striking 'Marriott' Sixties Mod Prince of Wales check 2 button suit by Gibson London features a stylish Retro contrast velvet collar. Some intricate and refined design details to ensure a truly stand out Mod look. A hint of Vintage Fifties Teddy Boy drape jacket influence to the jacket. Slim, straight leg Retro trousers to match. 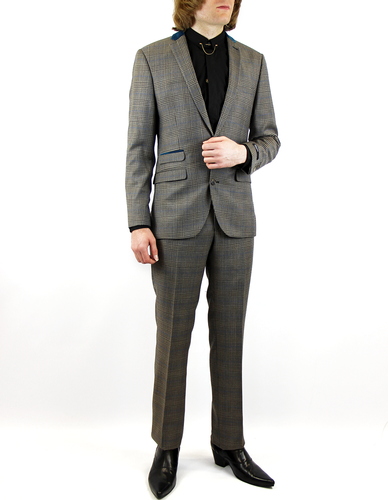 'Marriott' Gibson London Retro Mod POW Check Suit. 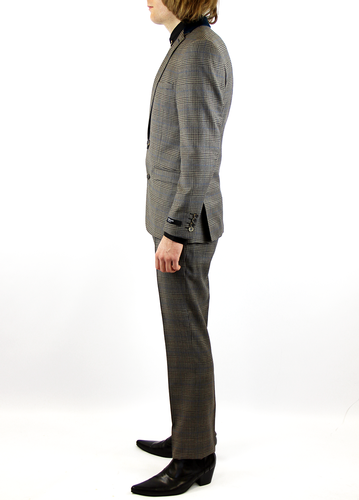 'Marriott' Mens 2 button Mod Prince of Wales Check suit in taupe. Retro teal green velvet collar and piping finish to the Mod right side ticket pocket. Two flap side pockets and traditional open welt breast pocket. Slim Retro notch lapel, 4 button non working cuffs. Cool Mod side vents. A subtle yet stand out blue Retro stripe runs throughout the POW check design. The 'Marriott' Mens Mod 2 piece suit by Gibson London incorporates Retro globe lining to compliment this seasons Vintage travel theme. Slim, straight leg trousers to match. Two slanted side pockets, Retro jetted pockets to reverse, classic belt loops and tailored Mod double clasp tab waistband. Zip fly. The 'Marriott' Mens POW check Mod suit with Retro Velvet collar offers a distinctive and debonair look for the discerning fashion connoisseur. GIBSON LONDON 'MARRIOTT' MENS RETRO SIXTIES MOD POW CHECK VELVET COLLAR SUIT. 'MARRIOTT' MENS RETRO SIXTIES MOD POW CHECK VELVET COLLAR SUIT by GIBSON LONDON - Mens taupe Prince of Wales check Mod Marriott suit with 2 button fasten - by Gibson London. Retro teal velvet collar for a cool Fifties Vintage inspired contrast. Two side pockets with flap detail and stylish Mod right side ticket pocket. Open welt left breast pocket. Slim Retro notch lapel, side vents and 4 button non working cuffs. 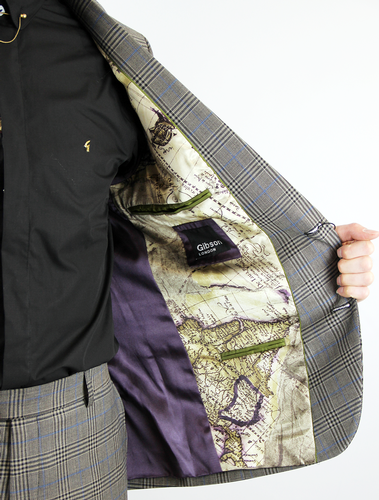 Retro seasonal globe lining finishes the 'Marriott' blazer off in style. Trousers with belt loops, 2 slanted side pockets and Retro jet pocket to reverse. Zip fly, double clasp tab waistband. Mod slim straight leg fit. The Prince of Wales check fabric is highlighted by a cool Retro blue stripe detail. 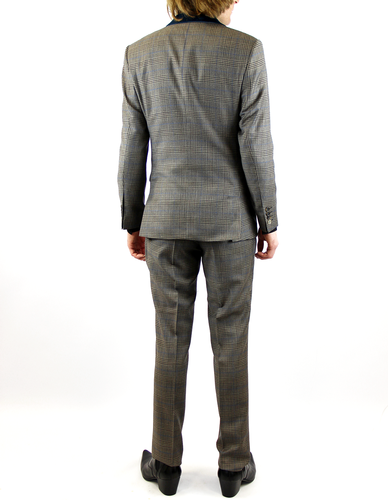 'Marriott' Mens 2 piece Prince of Wales Check Mod suit by Gibson London. Composition: 60% Wool, 40% Polyester. SKU: G13222MN Gibson London Taupe POW Check Suit. GIBSON LONDON 'Marriott' Retro Sixties Mod POW Check Velvet Collar Suit (Taupe). Comes in a set. 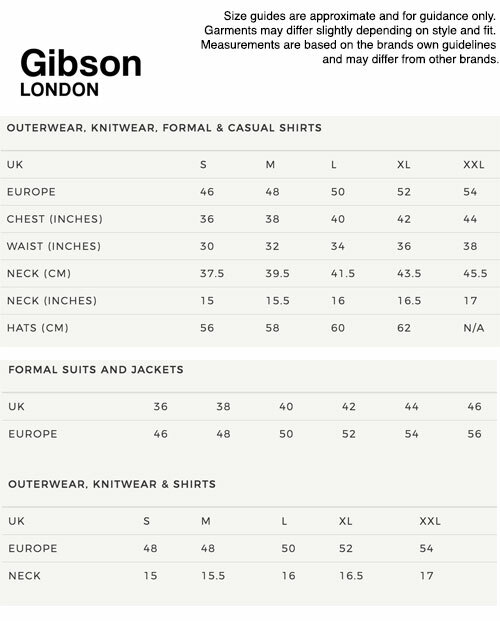 Trouser size is to match the chest size. General rule of thumb applies: Knock 6 inches off chest size for relevant waist size.